Learn about the range of engineering and science courses from Victoria University. We offer everything from sports engineering through to environmental management. Gain the skills to take your career further. You can study at short course, TAFE, degree or postgraduate level. 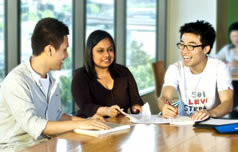 EAP is a university and TAFE preparation course. It is designed for students with upper intermediate to advanced levels of English who want to gain admission to an Australian TAFE, undergraduate or postgraduate course. Study a one-year specialised diploma, with more focussed academic and English support to better prepare you for success in undergraduate study. On completion, you will be guaranteed entry into the second year of a nominated bachelor degree. This course teaches you foundation skills in mathematics, physics and problem-solving in preparation for further engineering studies. Develop an independent and creative approach to building design and learn about the cultural, social, technical and sustainable issues that are associated with the built environment. Become a specialist in building and construction regulations, safety and design with this three-year degree in building surveying. Take a leading role in exciting, large-scale building construction with VU's Bachelor of Construction Management (Honours).You’ll learn all the skills needed to manage residential, commercial and industrial projects. Launch your career as an architectural engineer with the Bachelor of Engineering (Honours) (Architectural Engineering) at Victoria University. Gain practical and problem-solving skills working on projects in the workplace that will help launch a career as an electrical or electronic engineer. Get set for an exciting career inventing devices and generating clever solutions to engineering challenges, with a Bachelor of Engineering (Honours) (Mechanical Engineering) from VU. Gain the skills and knowledge of IT applications needed to work in the field of network and systems computing. With an emphasis on project work, this course provides study at a fourth-year level which builds on the knowledge and skills developed at degree level. Gain specialised skills in electrical power, telecommunications, process engineering or water management and aim for a top engineering career with the Master of Engineering. Prepare for a rewarding project-management role, or learn new skills for your current project-management position, with a graduate qualification from VU. You’ll gain a diverse and in-demand skill set for a challenging and rewarding career when you study the Master of Project Management. Develop your knowledge and focus your practical skills on a specific research area in engineering with the Master of Engineering (by Research). Become a leading researcher and designer of innovative engineering solutions, with a PhD in Engineering from VU. Make real advances in IT and mathematical modelling with original research in your PhD in Information and Computer Sciences. Contribute important findings with a PhD in Science conducted in VU's world-class research institutes and collaborative industry studies. Undertake important and innovative engineering projects. Our integrated program provides an alternative path to a PhD in Engineering. Aim for career as an academic, IT expert or computer scientist. Our integrated PhD teaches you best-practice research methods before you begin original and important study. Enhance your range of knowledge in various research fields across health, biomedicine, IT and science. I studied Architectural Engineering and now work as a graduate building services engineer. VU helped me get to where I am today by providing me with a lot of practical experience – something that is unique in the industry. VU brought in a lot of real life engineers, building practitioners and leading technologists to run sessions with us on how the industry works and the kinds of skills employers are looking for. Whether you are interested in specialising your career or just improving your handyperson skills, we have many courses to help get you started. We offer over 20 courses in engineering ranging from electrical to civil engineering. Develop the technical, organisational and personal skills needed to manage complex projects in unstable, changeable environments. From applied biology through to physics, we offer a range of learning suitable for everyone. Learn the ins and outs of building surveying with our TAFE and undergraduate courses.